Mattresses come is several sizes so buying the correct size is vital. As a general rule, when a cot mattress is gently pushed to one side there should be no more than a 4 cm gap to the rails. This is to prevent your baby from becoming trapped. There are the least expensive type and. The most popular has a ventilated head section and a wipe clean PVC covering on the lower part of the mattress, over a foam interior. Lots of different types of covera are available. 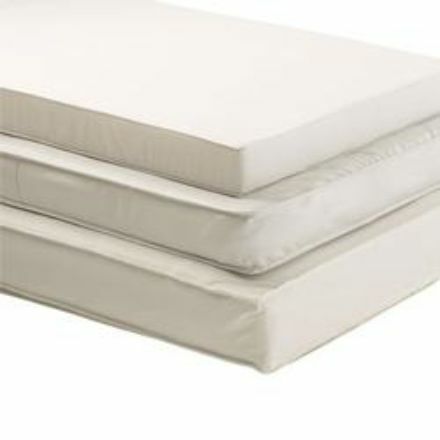 These mattresses are of a similar construction to sprung adult mattresses. There is a huge choice of fabric covers which are often removable for washing. This type is the most expensive and also the longest lasting. The construction is based on latex-coated coconut fibre to form an open cellular core which is finished with layers of other natural products such as wool, cashmere.